98.6% of internet users accessed the internet through mobile devices in China. Internet penetration in urban areas rose from 71% to 74.6%. The 10- to 39-year-olds represented 67.8% of all internet users in China. The largest user group were students (25.4%). 610 million users shopped online in 2018, 14.4% more than a year ago. And, 406 million users ordered food delivery online. 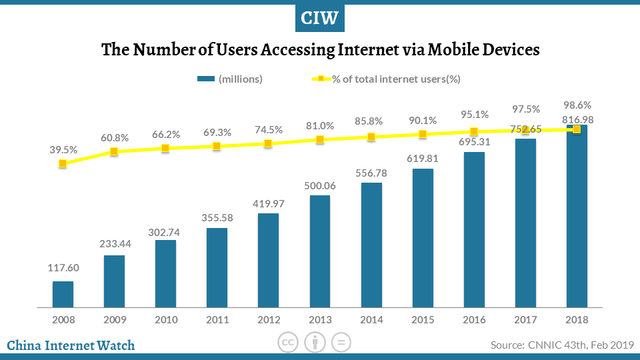 In China, a total of 816.98 million users used mobile devices to access the internet as of December 2018, representing 98.6% of the total internet users. That was 1.1 percentage points higher than a year ago. The percentage of users who accessed the internet via television grew to be 31.1%, 2.9 percentage points higher than a year ago. The percentage of users who used desktop computers to access the internet decreased by five percentage points to 48%. In 2018, each user spent an average of 27.6 hours online a week, 0.6 hours more than a year ago. The total number of internet users in China reached 829 million as of December 2018, a net increase of 56.53 million. Internet penetration was 59.6%, 3.8 percentage points higher than a year ago. Sorted by areas, the number of internet users stood at 607 million in urban areas with a presence of 73.3%. That was a net increase of 43.62 million or 7.7% higher than a year ago. The number of internet users in rural areas increased by 6.2% to 222 million, accounting for 26.7% of the total. Internet penetration in urban areas rose from 71% to 74.6% as of December 2018. By comparison, internet penetration in rural areas increased from 35.4% to 38.4%. The numbers of male and female internet users in China were almost evenly split, with slightly more in the male. The 10-39-year-olds represented 67.8% of the total internet users, among whom, those aged between 20 and 29 years took up 26.8%. The 40-49-year-olds enhanced their presence from 13.2% a year ago to 15.6%. Users aged above 50 years accounted for 12.5% of the total, which was 10.5% a year ago. The major force of internet usage were those who received junior high school (38.7% in proportion) or senior high school/vocational school (24.5% in proportion). Those who at least earned a bachelor degree represented 9.9% of the total. Speaking of professions, the largest user group were students (25.4% in proportion), and then there were freelances/self-employed (20% in proportion). 12.9% were senior/mid-level managers and company staffs. Seeing from monthly earnings, those earned from 2000 to 5000 yuan accounted for 36.7% of total Internet users. The above 5,000 yuan earners represented 24.1% of the total, 3.9 percentage points higher than a year ago. Around 792 million internet users used instant messenger, accounting for 95.6% of the total. Specifically, 780 million of them used it through mobile devices, a net increase of 86.7 million from a year ago. The number of search engine users were 681 million, representing 82.2% of the total internet users. In particular, 654 million of them used search engines on mobile devices, a net increase of 29.98 million from a year ago. 610 million users shopped online, 14.4% more than a year ago. That was 73.6% in presence. 592 million of them shopped through mobile devices, 17.1% more than a year ago. 406 million users ordered food delivery online, an 18.2% increase year-on-year. 397 million of them ordered through mobile phones, an increase of 23.2% year-on-year, which represented 48.6% of total internet users. The number of online payment users reached 600 million, 69.3 million or 13% more than a year ago. Its presence rose from 68.8% to 72.5%. 583 million of them made payments via mobile devices, an increase of 10.7% year-on-year. Usage penetration rose from 70% to 71.4%. The percentage of users using online payment services offline up from 65.5% to 67.2%. The user base of the online video went up by 33.09 million to 612 million, accounting for 73.9% of the total. 590 million of them watched video on mobile devices, a net increase of 41.01 million. As of September 2018, there were 322 million smart televisions, 218 million of which were installed. Over half of online video users watched videos via television programs. Download CIW whitepaper below for more latest statistics on China internet.